Attention: News Editor CHILLIWACK/BC/MEDIA ADVISORY--(Marketwire - April 24, 2008) - April 24, 2008 (Chilliwack, BC) -After its unknown whereabouts for the last 28 years The Terry Fox Foundation is thrilled to announce the discovery of the original van that was an integral component of Terry Fox's 1980 Marathon of Hope. This discovery follows shortly after the 28th anniversary of the start of the Marathon of Hope. On April 12, 1980, Terry Fox began his run across Canada raising money for cancer research. After dipping his artificial leg in the Atlantic Ocean in St. John's, Newfoundland, Terry ran nearly a marathon each day for 143 days. He was followed by steadfast friend Doug Alward in the van. Terry was forced to stop his run on September 1st just east of Thunder Bay, Ontario due to the return of cancer. Terry Fox flew back to British Columbia leaving behind most of his belongings from the Marathon of Hope, including the 1980 Ford Econoline van he used to carry his supplies, monitor his running mileage, collect donations and slow down traffic. This was the last time the van was seen. Last year, following up on a tip, Darrell Fox, Terry's brother and National Director of The Terry Fox Foundation, acquired the original van that was Terry's home on the road. "The family and Foundation are pleased to rediscover a major artefact integral to our history and a piece of Canadiana." said Darrell. "The van was Terry's home for 5 ½ months. It is where he felt protected from the madness outside; where he slept, prepared and perspired." 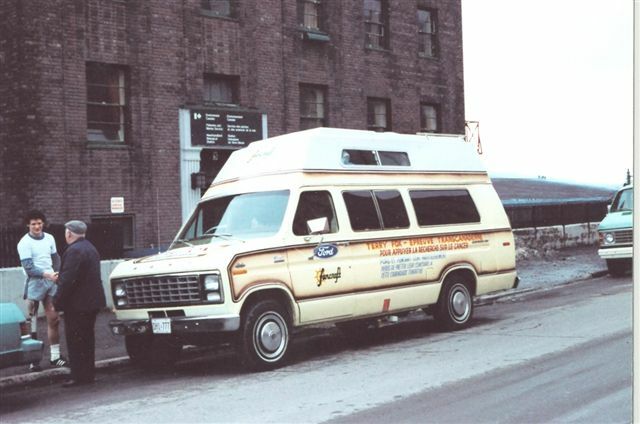 Upon hearing that the Foundation had retrieved the van, Ford of Canada stepped up and committed to restoring the vehicle to its original condition. It will then be able to again travel across Canada to raise awareness and to collect donations for cancer research as another extension of Terry Fox's Marathon of Hope. "We are proud to be a part of this extension of Terry Fox's Marathon of Hope," said Dean Stoneley, vice-president, general marketing, Ford of Canada. "What Terry accomplished for cancer awareness is a chapter of Canadian history that remains unsurpassed, even today, 28 years after his run." "Ford of Canada was one of the first companies to show their support long before Terry ran his first Marathon of Hope mile, well before a dollar was raised and prior to anyone realizing that Terry would capture the imagination and interest of a nation." said Darrell Fox. "We have enjoyed reconnecting with Ford and are thankful for their contribution and the opportunity they are giving the public to experience the Marathon of Hope." The van is currently in the possession of Ford of Canada for the restoration and will be unveiled in late May 2008. The first Terry Fox Run for Cancer Research was organized in 1981. In 1988, The Terry Fox Foundation became an independent trust and has continued to pursue Terry's dream of finding a cure for cancer. To date, over $400 million dollars for cancer research. To further our fundraising mandate The Terry Fox Foundation will host the Terry Fox Works Day on September 12th, The Terry Fox Run on September 14th and the National School Run Day on September 26th. Visit www.terryfoxrun.org for more information or to support cancer research. Terry Fox Van photo available on link below.